Last week we posted a visual guide to invoicing. 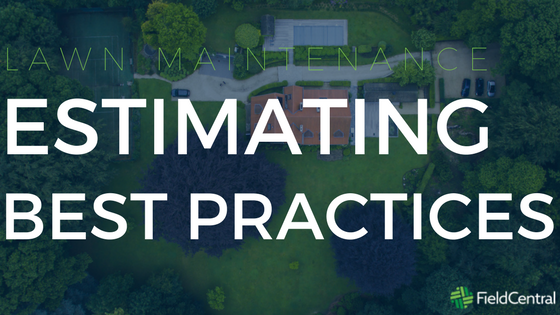 But before you’re even able to send out an invoice, you must first put together an estimate that. One that - not only wins the business - but is financially sustainable. Competition is getting fierce in the lawn maintenance business. Trying to win the client by offering the lowest bid is becoming less and less palatable. Win new accounts while, at the same time, keeping your profit margins up by following these best practices. Winning jobs solely on having the lowest bid is a slippery slope for your business. It’s very difficult for your company to make any profit and consequently grow. Giving the occasional deal to a customer is fine, especially long-time, loyal customers. But if you provide the lowest bid to one customer, they may tell their friends, and you will have to provide that same price model for all of their references. Then these new customers tell their friends and now you’re Mr. Cheap and have spiraled into the deep abyss of suffocating margins and a kinked cash flow. Plus, if you run into problems on the job, your backs against the wall. You didn’t budget enough money to handle disruptions to the original plan, and the money will be coming out of your own pocket. The quality of your work and your superior customer service should seep into every orifice of your presentation. Provide them with customer testimonials. I’ve even heard of some customers who will have potential clients meet them at the nicest properties they manage to give them a tour and explanation of what they do and how it puts them above the competition. If that’s a bit intense, pictures and visuals can basically do the same thing. Have them on hand and show off your work. People love visuals, plus they don’t need to take your word for it. The proof is right in front of them. The point is to make the bid about how much happier you will make the customer compared to the other guys, instead of letting it be about how much you will charge. Offer alternative materials or a less expensive package of services. You can also offer payment plans for customers whose budgets don’t stretch that far. Providing payment plans allows your customers to still benefit from your excellent service, without breaking the bank or going with a “cheaper” job. But not every customer should be on a payment plan. And never agree to something that goes compromises what’s best for your business or your sound judgment. It all starts with being diligent and prepared. Walk the property and take notes. Consistency is crucial for business. That means having a standard process and method to forming estimates - based on measurements and dollar signs - not gut feelings and eye-balling. This allows you to educate the prospect on how your company will perform the work so they understand each cost of every service. This eliminates the where-does-this-price-come-from uncertainty. Show them how you will help them avoid costly problems down the road. Teach them ways to save on lawn care, like fertilizing grass in the fall to encourage root growth when top growth won’t go crazy. It may be helpful to present bids in person at the client’s home or office. This lets you control how the information is presented and forges a relationship with potential customers, which can influence them to choose you.